One of the things I have come to truly love about blogging is the community. Instead of there being cut throat competition, people really help one another, give each other tips, and cheer on all of each others successes. 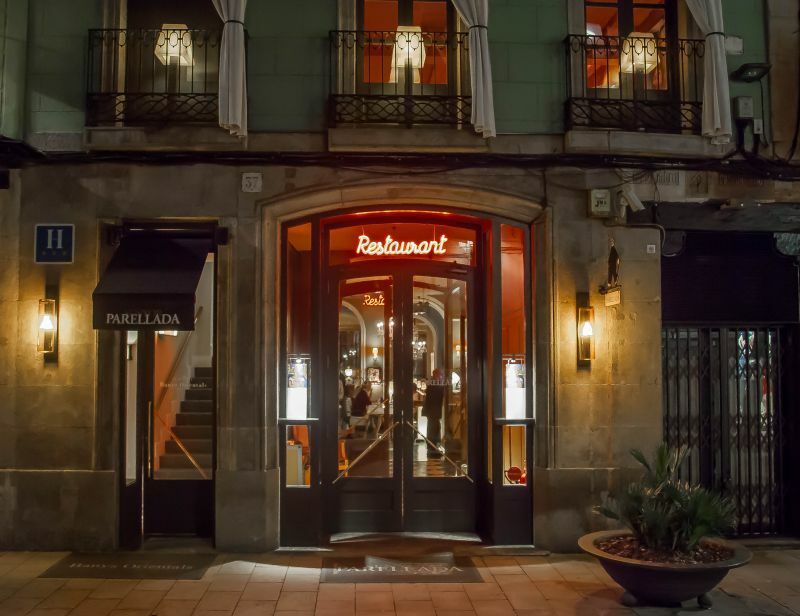 I received a recommendation for this restaurant Senyor Parellada in Barcelona from my friend Michael Bogdanski who owns the restaurant Off The Square in North Carolina. (We wrote about them here.) He saw I was in Barcelona and suggested the restaurant to me via Instagram. I am so glad I took his suggestion and went for dinner. What a fabulous place! Thanks, Michael! I don’t research restaurants for the most part before I visit them. I always look to go and be open minded about the atmosphere and the food. Other than asking the concierge at our hotel for a reservation, we didn’t know anything about Senyor Parellada before going. When my friend and I arrived, we were both so impressed. Senyor Parellada is located down what I would call an alley off a major road. The outside was beautiful and charming. It was gorgeous to photograph, and I have to say I just knew it would be a special night. Moving into the restaurant, I couldn’t have been more pleased. 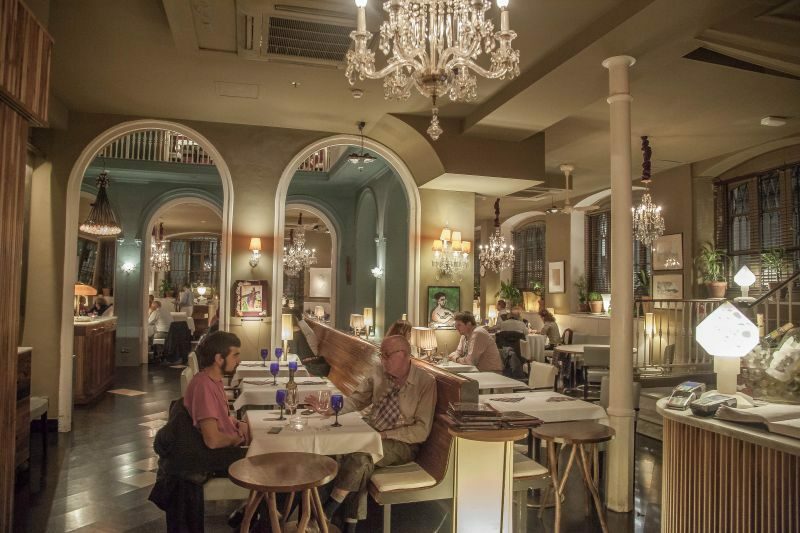 The decor was simple and beautiful, very upmarket bistro chic with duck egg blue and taupe walls, lovely chandeliers throughout and black and white accents. The character of the old building had been kept, including gorgeous woodwork and plaster accents. The overall effect was cozy, a little glamorous and had a high level of European flair. 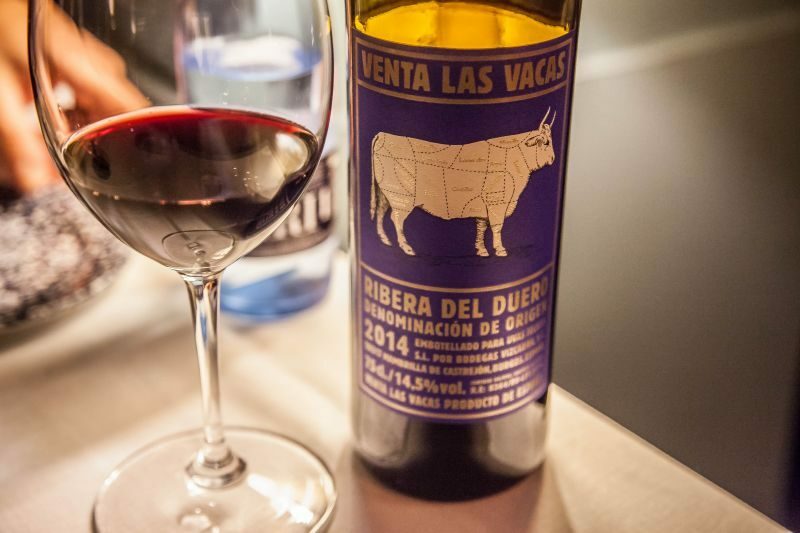 The wine was a 2014 Ribera Del Duro: a blend of merlot and tempranillo. For such a young wine it was rich and smooth and had plenty of character. It had great acidity so it paired beautifully with the food. Notes of fig, plum and baking spices filled our palettes. There were still tannins in the glass, but they were subtle rather than being the only story. I would say it was a medium to full-bodied wine without being at all heavy or needing big meat to shine. In fact, I had mine with a paella, which was a bit of a weird choice but it worked just fine. My friend Debs and I decided to share an appetizer and dessert so we could have room for both including an entree course for our evening meal. I was really happy we did because the portions were large and no way could either of us managed all three. 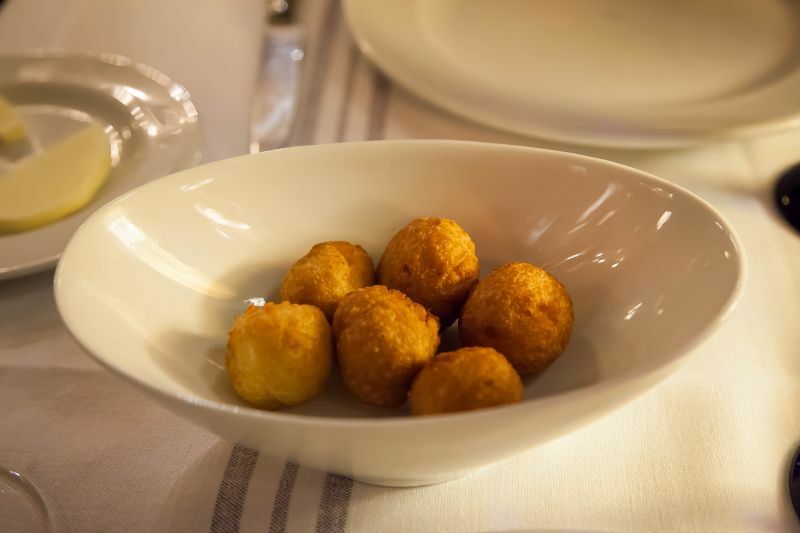 For our appetizer course, we both agreed on the fried cod balls. Ok, this doesn’t sound great from the description but it was wonderful. Lightly smoked cod fillets mixed into mashed potato and rolled in breadcrumbs before deep frying. They were so delicious we gobbled them up. For our main course, Debs ordered the veal, and I ordered the special house paella. I felt that as I was in Spain I should order it at least once so I could write about it. When our meals came out, they both Wow’d. 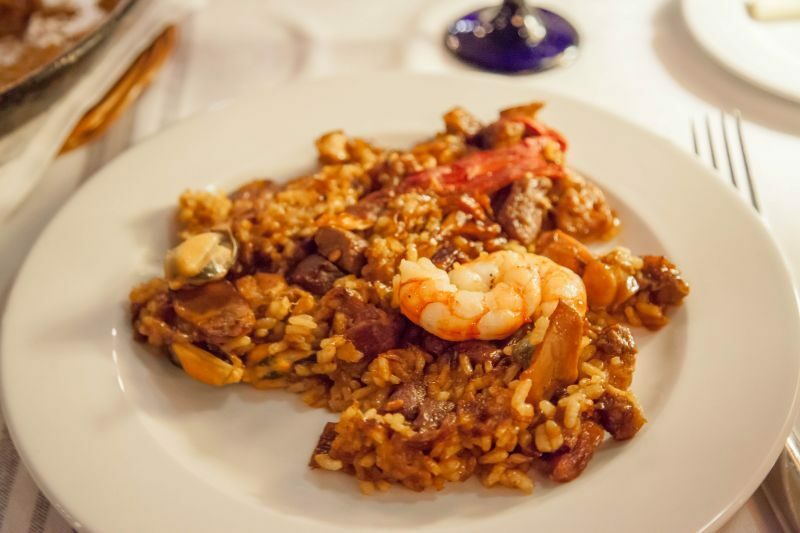 Mine came out in a traditional paella pan with the seafood mixture placed beautifully on top. (Unfortunately, the waiter was too quick and started serving the paella onto my plate before I could take photos of it.) I was surprised when tasting it how beefy and savory it was rather than the ones I am used to with the light saffron rice and seafood mixture. This had all kinds of meat in it along with the seafood. All of the flavors really stood up beautifully with the wine. Debs veal was amazing. Neither one of us had ever seen it served this way before. 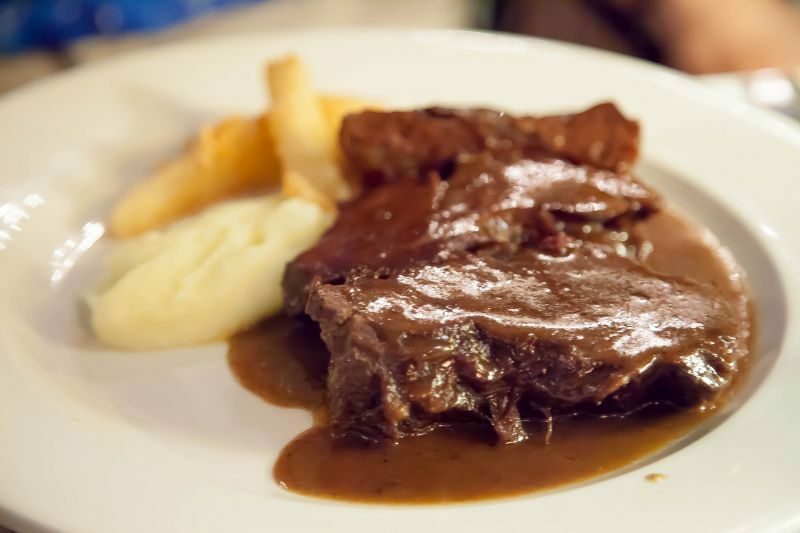 It was a large portion of veal, almost served like a short rib slathered in a rich gravy. Usually, I see veal served sliced very thinly. It was delicious! It was served simply with potatoes that were made into wedges then boiled. The entire thing was very rich and extremely satisfying. For dessert, we settled on a chocolate mousse. It had a whipped cream layer and shaved chocolate on top. It was good, although a little sweet for me, so I was happy with just one bite of it. 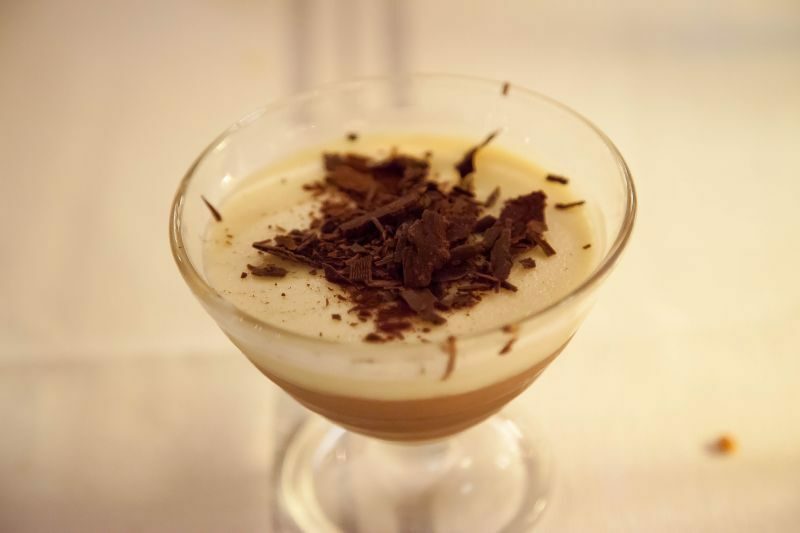 I think fans of milk chocolate would really enjoy this dessert. What a wonderful night and a fabulous meal. The entire bill for the two of us came to $70! 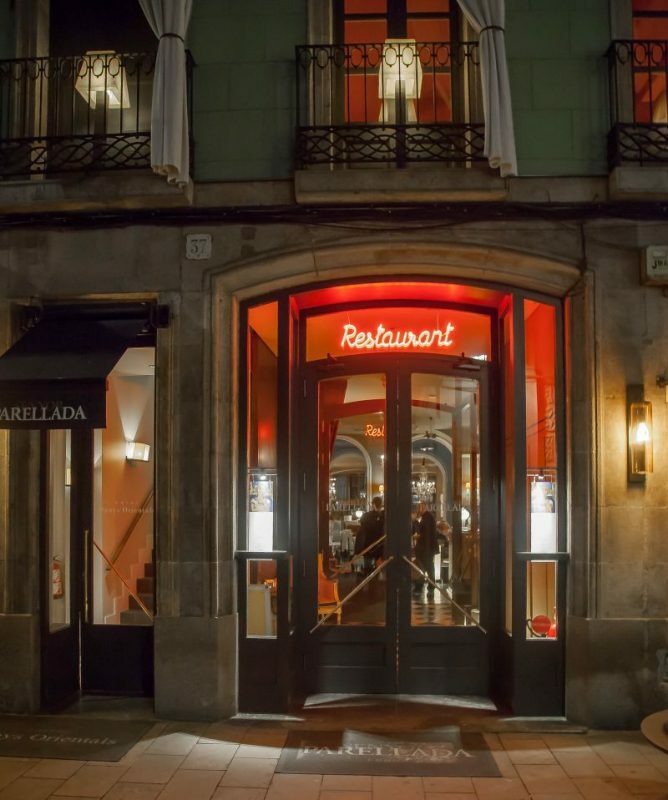 Fantastic value for money when talking about a restaurant of this caliber including wine. I would highly recommend that you visit Senyor Parellada if you visit the beautiful Barcelona. You won’t be sorry you did! This restaurant is absolutely gorgeous inside. The food likes amazing and that chocolate mousse – OMG! It truly was wonderful.. and really inexpensive! I hope Spain’s problems blow over soon so tourism gets back to normal. Thank you for commenting! !